The Westcott Softbox 1x2 with White Interior is one of an enhanced line of modifiers that perform as admirably as their standard softboxes do, but are also fabricated with structural integrity that, as their 10-year warranty attests, is up to the challenge of years of use. 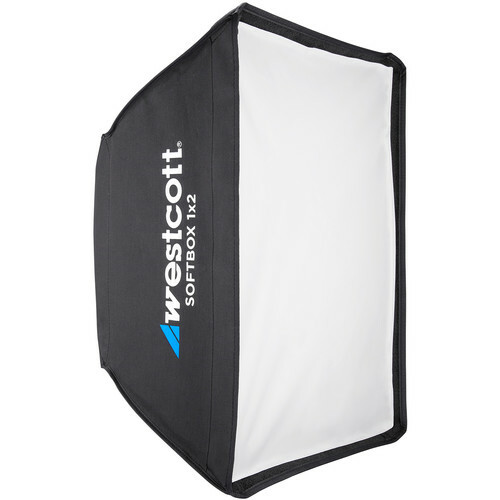 Since longevity is key to the softbox's construction, Westcott uses solid steel rods and extended rod sleeves with reinforced pockets for a tight, smooth fit. Although not made specifically for hot lights, heavy-duty fabrics backed by double-layer heat-resistant technology allow the Softbox 1x2 to withstand up to 650W. To support this type of use, tent-like vents are installed in the body of the modifier to dissipate heat. The shape and size of this softbox is ideal for work in tight spaces, for use as an accent light, or for tabletop or small object photography. It's also a good choice for hairlight or for selective lighting of your subject. The Softbox 1x2's white reflective interior maximizes your light source's output while the removable front diffuser softens it and produces a flattering quality of light with open shadows and moderate contrast. The diffuser has been thoroughly tested and found to be totally free of color cast. This light modifier also features a recessed touch-fastener edge for quickly mounting the included front diffusion panel and the optional 40-degree egg crate grid.